Another year, another miraculous release from NECA. As a child, Bruce Wayne watched his parents' murder in the streets of Gotham City. After searching the world for answers to injustice, he returned to the city he loved to restore it to its grandeur. The task is larger than a mere man can accomplish, so Wayne assumes the guise of Batman to battle the forces that are destroying Gotham's soul. We have, of course, already received a slew of Batman Begins Batmen. Mattel made several lines' worth, both in the 5" scale via the standard movie toyline (though there was really only one good one, and it was only released outside North America), and in the 6" Movie Masters line. [Don't forget the 13"er --ed.] Now here comes NECA with another offering in their 7" scale, released by (or in conjunction with) WB Home Entertainment. The sculpt, by Djordje Djokovic of Neobauhaus Studios, is as impressive as you'd expect. The Begins suit was armored, but still fairly smooth and sleek when compared to the intricate plates that covered his second suit. The pieces of the shaped body armor fit together tightly, with no gaps in between. The detailing on the belt is impeccable, with the various containers and devices mounted on sliding rails, and a complicated closure system holding it all together. Good thing the cape is softgoods, so you can lift it up to see all those details! The proportions of the figure seem slightly off, however. 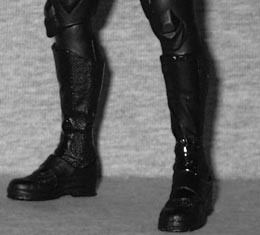 Maybe it's something about scaling down the quarter-scale figure to a third its size, but he ends up looking kind of wonky: the lower legs seem way too skinny, not at all large enough to represent human shins wearing thick boots; the hands should be slightly larger; and the head seems to sit too high, like the neck isn't sitting down on the body the right way. Fortunately, being all-black helps hide a lot of sins. 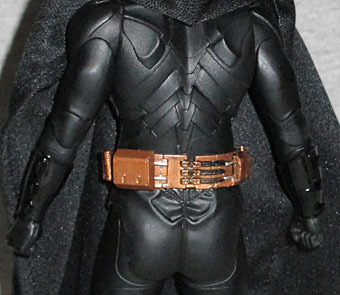 Most of the figure is matte black, but the front of his shins and his League-of-Shadows-inspired arm guards are gloss. His belt is gold with silver detailing. You'll want to compare figures at the store is you can, however, because the skintone paint around his mouth can get very splotchy, and his crazy eyes may not point the right direction. We do get decent articulation, though it's not quite as good as the 18" version had. 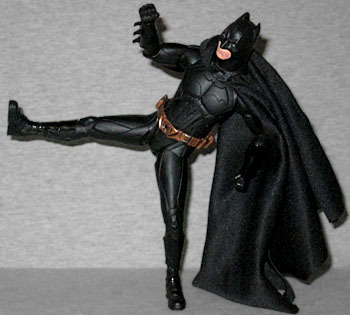 Batman moves at the neck, chest and ankles (balljointes), shoulders, elbows, wrists, hips and knees (swivel/hinges), and the waist and thighs (swivels). 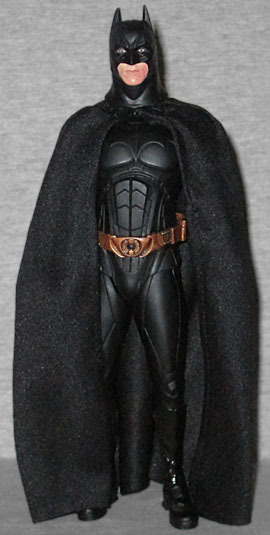 The cape is, as mentioned before, softgoods, and it's mounted directly to the figure's chest, beneath the two triangles on the cowl that pretend to hold it on. Although it may have earned a complaint up above in the paragraph about proportions, the way the head drifts slightly above the torso means that the range of motion there is quite good, even if being unable to turn his head was one of Christian Bale's chief complaints about this suit (the other being that there was no easy way to go to the bathroom). The accessory count has been dropped just as much as the articulation. 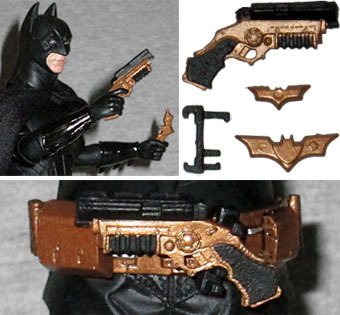 This figure has two batarangs of differing sizes, his grapnel gun, two extra hands (one to hold the gun, one to hold a batarang), and a small clip to attach the gun to his belt. The big version got all that and more! Fortunately, NECA's stock photos of the 18"er showed how the gun clip was supposed to work, because otherwise it would have been tough to figure out. This year, the packaging is not just a scaled-down version of what the large toy came in. The original was in a gray "Dark Knight Trilogy" box, while for this one, designer Chris Longo went back to the black-and-yellow Begins art. The backdrop behind the figure is a swarm of white bat silhouettes, and the front has the standard merchandising painting of Batman himself. Unfortunately, all the images of the toy on the box are of the quarter-scale figure, not the one you're actually buying, so it shows better poseability and accessories that you don't get. And of course, the proportions look better. 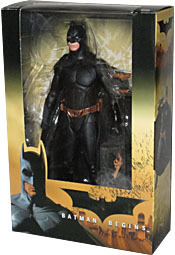 It's not that NECA's 7" Batman Begins figure is bad - even with its problems, it's done better than any of Mattel's attempts - it's just that after the truly outstanding Adam West and Michael Keaton figures, Bale isn't as mindblowing a release.